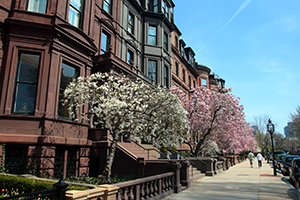 Overview: The Back Bay is home to several beautiful parks, excellent shopping and dining, and some of Boston’s most desired real estate. Culture: Newbury Street, Copley Square, The Prudential Center and Boylston Street, are all part of this special neighborhood. Shopping, dining, music and art – no matter what type of entertainment you’re looking for, you can find it here. Location: Back Bay is located in the heart of Boston along the scenic Charles River. Fenway Park, the home of the Boston Red Sox, and the Boston Common are both just a short walk away. Transportation: The MBTA’s Green Line has several stops in Back Bay: Arlington, Copley, Hynes Convention Center and Prudential Center. Back Bay Station also services the Orange Line as well as the MBTA Commuter Rail and Amtrak. Colleges & Universities: Berklee College of Music, Boston Architectural College. Tip: Register to save your favorites and receive email notifications when similar properties hit the market. Contact us for more information, questions and to schedule a showing. Very bright 4th Level - spacious one bedroom split. Great location to many colleges (NEU, Berkeley, MIT, BU, and Boston Conservatory) and center of Boston. Most utilities are included, heating and hot water. Kitchen area is being used as an open concept living room. Wonderful spacious parlor level one bedroom in a beautiful brownstone building on Commonwealth Ave mall. Heat, hot water, and electricity included in rent! Spectacular Victorian details including a coffered ceiling, crown moldings, ornate mantle, 12-13' ceilings, and decorative fireplace. Newly renovated modern kitchen and bath. Kitchen has dishwasher and disposal. Common laundry in basement. Available for June 1st - No smokers, pets, or undergraduate students please. First month, last month, security deposit and brokers fee required at lease signing.